His schoolmates also told him about the bagat—a mystical creature that kidnaps children and ambushes people on their way home—and dreams, which are very significant in T’boli culture and inspire the patterns on their traditional t’nalak fabric. 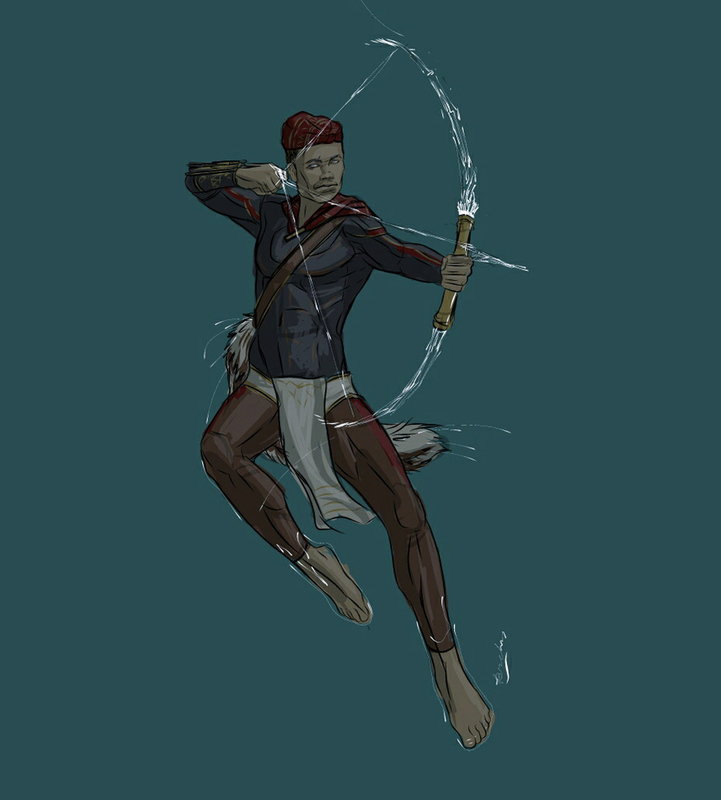 Today, all these tales have inspired Diwaten to come up with character designs based on the T’boli pantheon of gods. So far, the designs he’s posted on Reddit have been very well received, with users praising his work and offering suggestions. 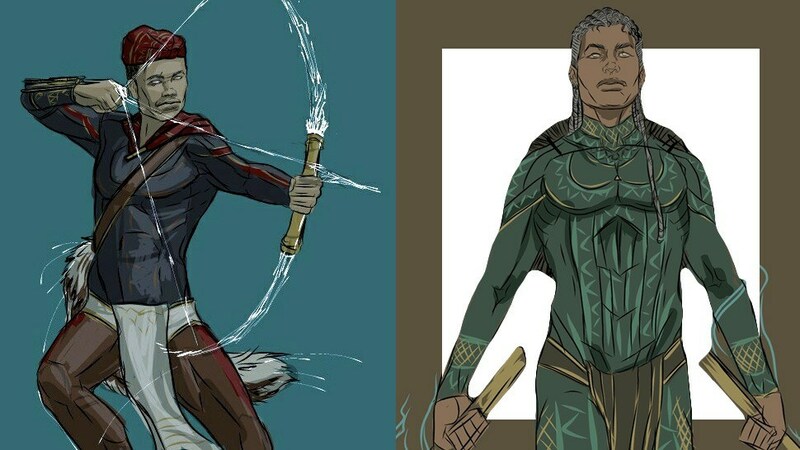 The first design he posted was for a character named Arteme Lus, based on the T’boli god of wild beasts. The name is a combination of his late friend Artemio, to whom the character is dedicated, and the T’boli deity Teme Lus. Elston gave the character a T’boli head wrap and a costume in black and red, colors typically worn by the T’boli. His next character is Victor Litik, inspired by the god of thunder. “I opted for a slim silhouetted garment to emphasize the T’boli inspired tattoos, sadok (wide hat), and arnis [sticks],” Diwaten explains. Diwaten’s latest character design is for a demi goddess, born of a mortal man and moon goddess. 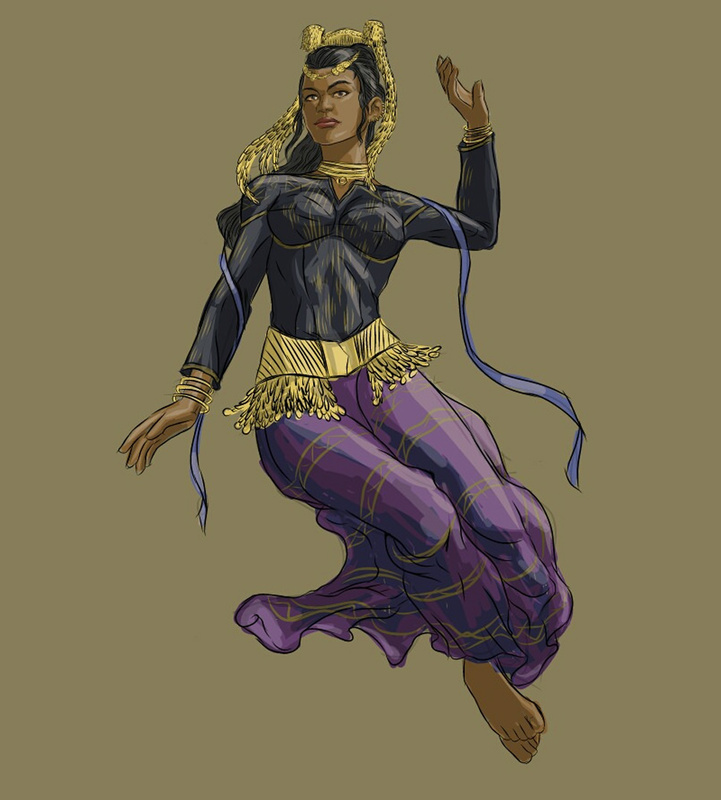 The silhouette of the garments and ornaments she wears are based on traditional T’boli garb. While purple isn’t a typical T’boli color, he opted for a cooler color palette to represent the moon. “Southern Mindanao’s (T’boli, Blaan, Maranao) folk tales are a treasure trove of stories of brave heroes, mythical creatures, epic battles, and enduring love, that I think that should be known to the new generation, to be apppreciated, and to be shown in a new light. That is why I am doing this,” Diwaten says. He plans on making as many characters as he can. “Given the deities present in the mythology of the T’boli people, I want to represent each and every one of them,” he explains. While featuring these characters in a comic book is part of the plan, Diwaten’s main goal is to bring awareness to the struggles of the T’boli when it comes to land grabbing, deforestation, and armed struggles, which Diwaten hopes to convey through his characters and stories. 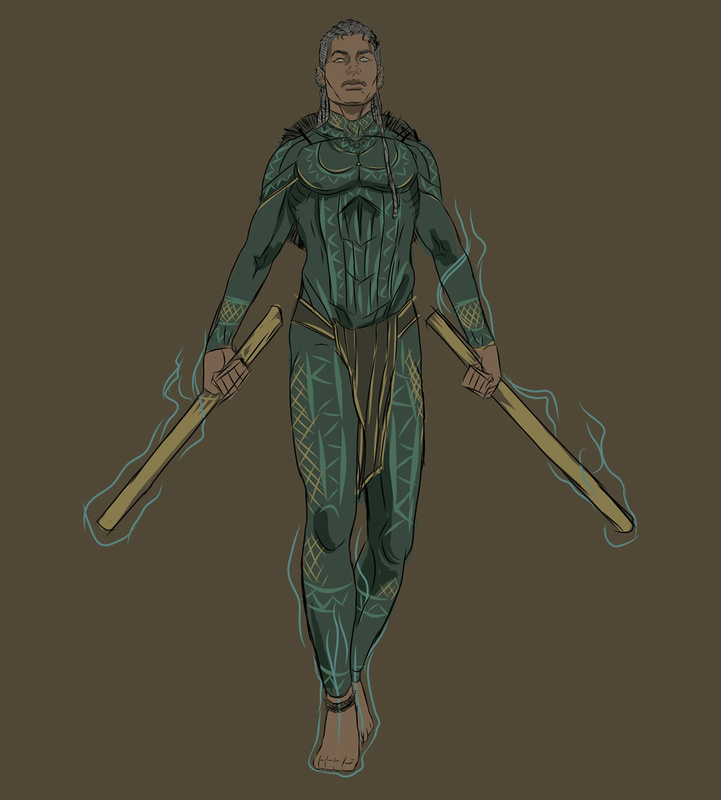 His character designs already have attracted curious viewers asking him about the gods they are based on, the T’boli elements of each design, and where they can learn more about T’boli mythology. 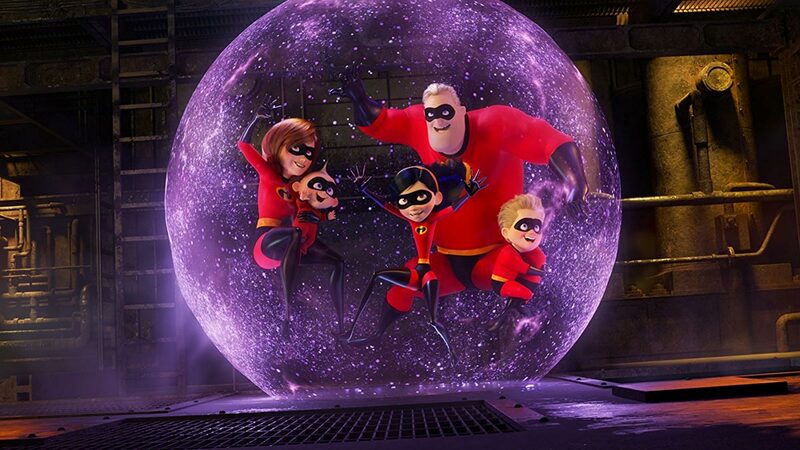 “I am very happy about it really. I am delighted to read the comments both the positive and negative. The constructive criticism really helps in my process too, I take the truth in them and learn from it. I bear them in mind whenever I design a new character. All in all the reception on Reddit pushes me to pursue this,” Diwaten says. We’re certainly looking forward to seeing more of Diwaten’s designs, and would love to read his comic book in the future. To see more of Diwaten's character designs, check out his Reddit profile.